Dear everyone, my job is real. Love, me. Locating a generic social media photo is easier than finding babies on your newsfeed. I love talking about social media so let’s do that then. In fact let’s start with some context, or a “Hahtag Throwback Thursday,” if you will. It’s July 2011. Father Neal and Augusta are in Lubbock, TX between the hours of 13:00 and 15:00. Father and daughter walk into a local grocery store, Leonard’s (RIP), for a few insignificant knick knacks. Augusta glances at her phone, then cheerfully announces, “I’m the mayor of Leonard’s on FourSquare!” Father ponders this and says, “And where does that get you in life? I can now answer my dad’s question. IT GET’S ME PAID, DAD. ACTUAL JOB-STATUS PAID. IN A REAL AMERICAN CITY AND EVERYTHING. Social media is a real job, people. It’s a thing, much to my parent’s dismay. In fact, it’s really amazing and an act of God that I am where I am today, considering my parents were NOT going to let me move to Dallas without a some form of magical rent-paying machine. So when I told them my plan after college was to move to Dallas for an unpaid internship, they said absolutely not. Y’all, I cannot stress enough, it was a fight for about two months, of trying to convince my parents to let me move to Dallas without a job. Thank God for the family therapist, who finally convinced them the ways of the world 2013. YAS MOM, YOU PAID A MAN TO CHANGE YOUR MIND TO CONFORM TO THAT OF YOUR THEN-22 YR OLD DAUGHTER, AND HE, I, AND DALLAS SEND YOU MANY THANKS. So while we’re all gathered together on the topic of social media, here is where I insert common myths associated with my job. i’ve actually never played farmville in my life. MYTH NO. 1: I SIT AND TWEET ALL DAY. This is annoying to no end, but I suppose that if I didn’t work in media, and had no idea how an agency operated, this is what I would think too. The fact is, I do not sit and tweet/post statuses all day. If I did that, I would very likely get fired, because doing that means none of the content was approved by editors or clients, WHICH MEANS DEATH. Does sitting and tweeting even sound fun to anyone? That sounds horrid and boring and lonely. Don’t be the person that sits and tweets all day. In all reality, I spend the LEAST amount of time inside Facebook/Twitter responding to things. The least. Truth: It’s obviously a part of the job, but it is NOT The Job. MYTH NO. 2: I KNOW EVERY SINGLE THING THERE IS TO KNOW ABOUT ALL SOCIAL MEDIA CHANNELS AND TECHNOLOGY AND THE CLOUD AND THE PURPOSE OF LIFE. I haven’t discovered the “know everything there is to know about social media marketing” drugs yet, but as soon as they’re available at my local CVS, I’m handing them my insurance card and O.D.’ing immediately. Social media changes more than updates in ISIS (too soon????). Every week (if not day/hour) a feature has been added, something has been removed, organic reach is harder on the newsfeed, and your S.E.O. is in danger of going extinct. And you have to stay on top of it all while crossing off those deliverables. I subscribe to my favorite media sites to try to StAy -N- ThE KnOw, but don’t one time a coworker in client service discovered Hyperlapse before me and it was the worst thing that’s every happened to me in my entire existence and I don’t like going back to that dark moment. Truth: I discover platform nuances and new work-around solutions (AKA things I didn’t know before) literally every single week, and I know there’s still more to learn and master in the realm of social media/newsfeed chasing. As far as technology goes, let’s just say I.T. is rarely bored. I hate Apple/iOS updates even more than character limits. And one time I had to call a friend to help me use the TV remote, BECAUSE NO, IT IS NOT OBVIOUS TO PUSH THE “AT&T” BUTTON BEFORE USE OK IT’S JUST NOT I CAN’T. MYTH NO. 3: SOCIAL MEDIA STARTS AND ENDS ON THE PLATFORM. Meaning, my job starts when I log into Facebook and type a status, then stops once its posted. THIS COULD NOT BE FURTHER FROM REALITY. I DON’T EVEN USE FACEBOOK TO POST ON FACEBOOK. Beyond just the creative phase of brainstorming and writing the content, there are hours (and eons) of strategy, analytics, and scheduling. In fact, the part your eyes see, the actual post/tweet/Instagram/update/share/comment, is the easiest (and most fun) part. It’s the GETTING IT TO YOUR EYES, at that exact (sometimes paid) place and time, and then measuring its success, the stuff that no one sees, is what really puts the food on my table. Because what’s the point of putting out content if you don’t put it in the right place? Or if you don’t analyze its success/failures? Or predict future campaigns based on what’s in front of you? Can you eloquently explain that in laymen’s terms for a client or describe its imperative role in the brand’s overall content strategy? okimdonesorry but rly u should think about that. Truth: I’m logged into the Microsoft office, Adobe suite, enterprise programs/tools to schedule/monitor/analyze content, CMS platforms, AND SPOTIFY every single day. There was once a time in my life, a short time, a long time ago, when I thought that everything I read on social media was published by someone at that second. I literally thought someone was sitting in Huffington Post offices just tweeting away, all hours of the day and night. I was talking to someone recently who thought the same thing. nOooOoOOoOooOoo. Almost all brand social media (and blog) content is scheduled to go live months/weeks in advance, only after rigorous editing/approval processes. Which explains why Joan Rivers rose from the dead to post about the iPhone 6. Truth: That Halloween tweet you just read was scheduled whilst that person was simultaneously texting his or her friends about 4th of July plans. This is why real-time marketing is a distinct, if not delicately artful, branding strategy. I can’t speak for all social media marketers on this obvi. But as for me, on any given day I could also be writing material for blogs or e-mail marketing, pulling/compiling analytics reports for blogs/e-mails/digital magazines, optimizing print content for digital through search engine optimization, researching the search volume and Google rank for keywords in an industry, auditing content, assisting in social media strategy in pitches to clients, or really anything random that pops up and involves internet. Truth: Evernote and the reminders app are my best friends. 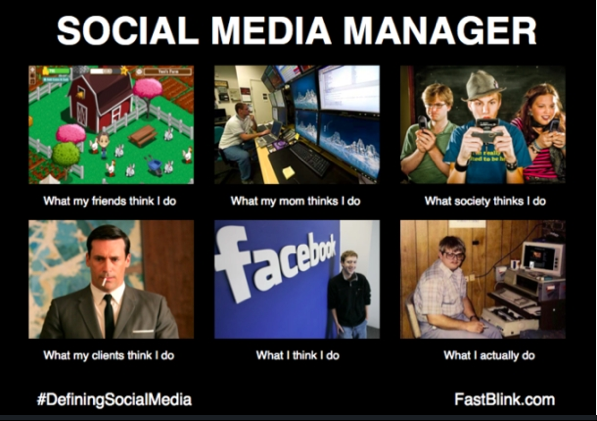 I work in social media too and I thought this was A. hilarious and B. Super accurate. Nice job! Thank you for reading and totally getting where I’m coming from! !